Rasmussen Reports, LLC operates as an electronic media company which collects, publishes, and distributes public opinion polling information in the United States. It tracks the political world, current events, consumer confidence, business topics, and the president’s job approval ratings. The company also conducts and covers nightly national tracking polls and scheduled state surveys. In addition, it posts commentary and political analysis articles by writers. The company’s data is cited in news media, broadcast outlets, and television entertainment programs. Rasmussen Reports, LLC was founded in 2003 and is based in Asbury Park, New Jersey. 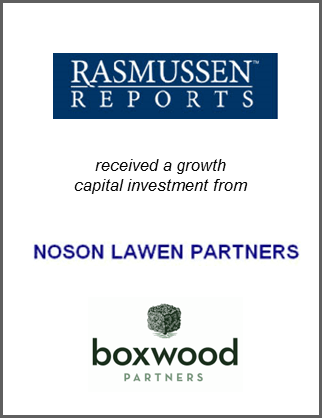 Boxwood Partners advised Rasmussen Reports, LLC on growth capital investment from Noson Lawen Partners. Boxwood Partners acted as the exclusive advisor to Rasmussen Reports, LLC with respect to the transaction.